It was one of the last warm evenings in early October when I met Simon from The Sausage Man Never Sleeps for the first time. He had a stand at Berlin’s first Stadt Land Food Festival and was about to close down for the day. I spotted a selection of coarse sausages in his display, the kind I got hooked on since I lived in England a few years ago. When I read the names of his creations I couldn’t help talking to him. Apricot, hazelnuts and cream cheese, apple and sage, or tomato, fennel and mozzarella sausage, doesn’t that sound heavenly? That’s exactly what I love to have on my breakfast table on a Sunday morning with some fried eggs, beans and bacon. This man offered what I had been looking for in this city for years! I had to learn more about his products, maybe make some sausages together so I asked if I could visit him in his kitchen. At 5 am (!) the following week we had a date. The city was still dark and quiet when I jumped on my bike, ready to watch my laid-back gourmet butcher from New Zealand prepare his new batch of sausages for the day. 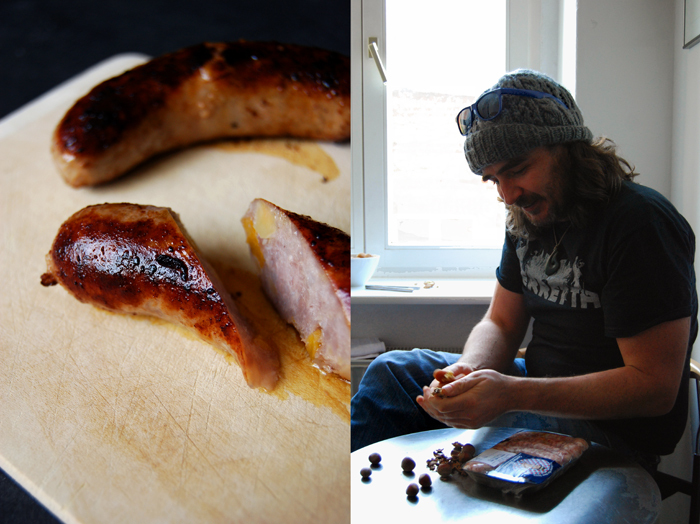 While he was stuffing the skins with the various fillings which he had mixed earlier at night before my arrival, we spoke about his journey that took him from the other side of the world (from a European perspective) to London and finally to Berlin. Here, he decided to live his dream and make his own sausages. He started working at a butcher shop which is coincidentally in my area and my favourite place for meat. At the Erchinger Fleisch und Wurstmanufaktur in Prenzlauer Berg, Simon finished his education to get the qualifications for the German market and he also became friends with the owner. Butcher Jörg Erchinger who took over the shop a few years ago, totally supports the young man and his visions. He believes in his unique products which have recently been featured by the renowned Feinschmecker magazine. Simon uses the rooms, machines and tools of the shop for his own production which he offers at the Markthalle Neun in Kreuzberg and other special food events. If you want to stay updated about the latest The Sausage Man Never Sleeps projects, you can visit his website or Facebook. I didn’t want to miss out on the chance to get these delicious sausages fried to perfection by the butcher himself. We couldn’t meet at his kitchen at home as the house is too dark for photos, so he took over mine. 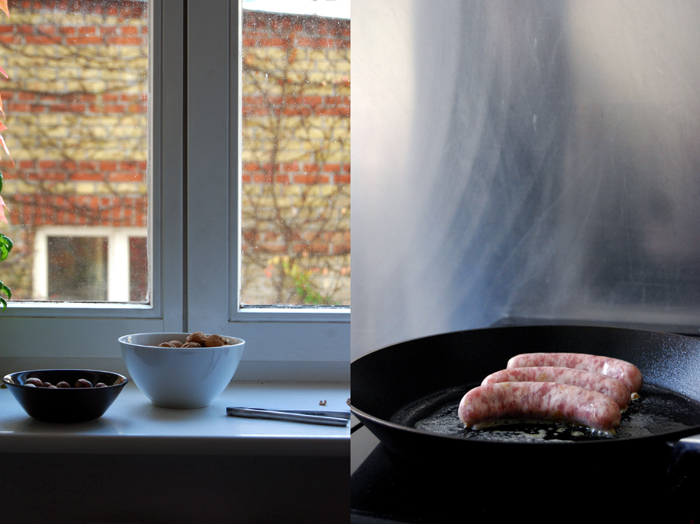 After a well deserved coffee for the sleepless sausage man and some hazelnuts that he spotted on my window-sill, we got down to frying. He cooked his work of the morning in a little butter and oil for about 10 minutes until the sausages were golden brown but still juicy. They were so good, I didn’t want to have them with anything else, I just enjoyed them and their pure flavours. I’m so happy that Simon offered to share one of his secrets with all of us, the recipe for his gourmet Apple and Sage Sausages! Mince the pork through a 1/2cm / 1/4″ mincing plate, add the salt and mix by hand until it sticks to itself (3-4 minutes). Add the apple, pepper and sage and mix throughly. Fill into skins but not too full so you can tie off sausages. 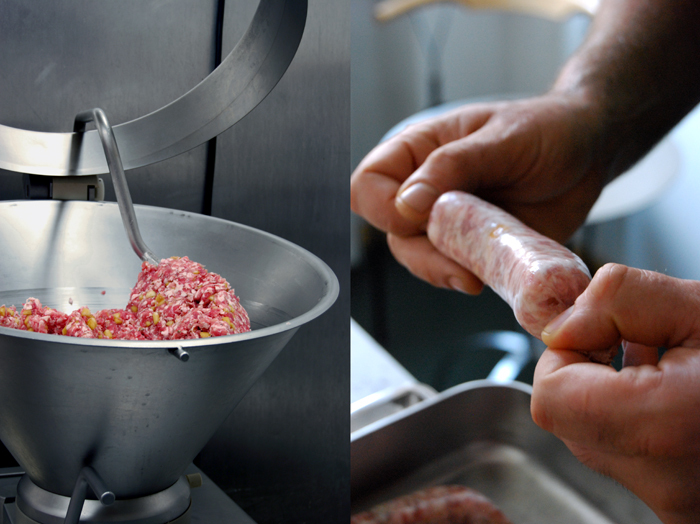 Tie off sausages with thumb and forefinger, cut in the middle of the twist which should be about 1cm / 1/2″ long. Shelf life of 2-3 days in the fridge or can be frozen if made from fresh meat. Give your pan a medium heat, a squirt of oil, a dob of butter and heat until foamy. 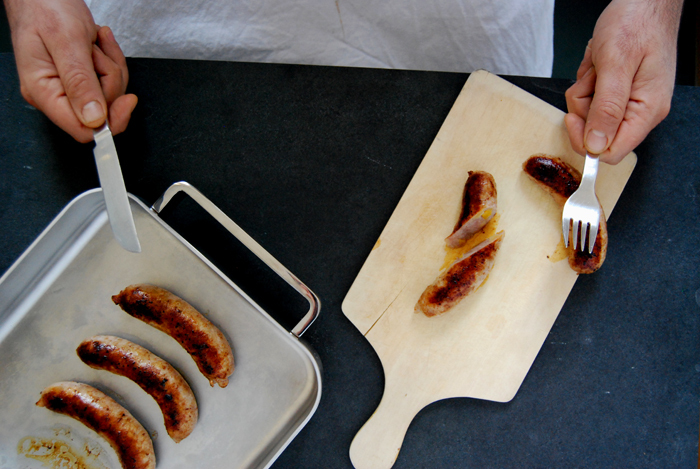 Pop sausages in the pan (there is no need to prick them first). Turn and baste in the pan juice until golden brown (9-10 minutes). You started an apprenticeship at a butcher at 16 but only started working as one 14 years later. Why did you wait so long and what drew you back to this craft? After completing my apprenticeship as a butcher I was looking for the next challenge and an opportunity came up to work in a freezing works (BIG Abbotoir) as a supervisor in a lamb cutting room. 10 years later after various office jobs in the food industry I found myself in London at the start of the recession with little chance of finding an office job in the food industry. Going back to being a butcher was the obvious choice. Leaving and getting back into hands on butcher work was not planned, it was opportunities that came along. You grew up in New Zealand, lived and worked as a butcher in London and you have now started your own sausage business here in Berlin. 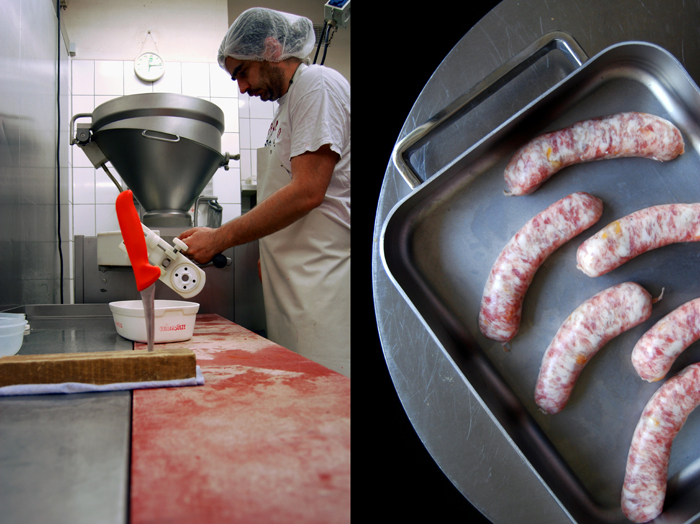 What are the differences in sausage making in these three countries? 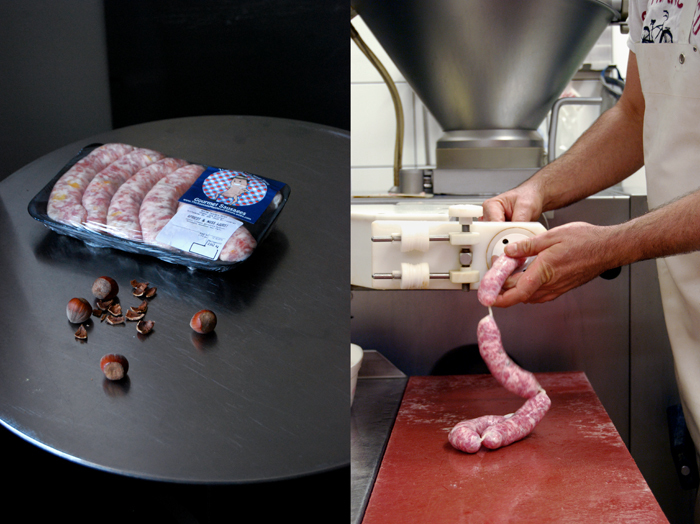 The basis of New Zealand sausages has an English theme as it was colonised by the British in the 19th century. New Zealand butchers have a lot of interesting flavour combinations in their sausages which is quite an inspiration for me. British sausages generally have more simple flavour combinations and are mainly pork based. German sausages are good and there is a huge range available, German sausages are world renowned as the best in the world. Do you have a sausage philosophy? Yes, keep it simple, use good quality ingredients and don’t add too much salt. How do you develop new sausage recipes? What inspires you? Trial and error, combining flavours that complement each other, that don’t overpower each other, using different textures to create interesting combinations that are more than just flavour and moisture. Your company is called ‘The Sausage Man Never Sleeps’, is that what a butcher’s life is really like? Not really, apart from Christmas time working in a butcher’s shop, usually that means 15 hour days for a while. 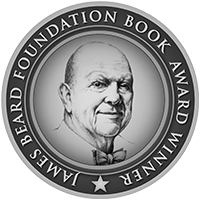 The name was inspired by the New Zealand sausage man who I worked with at Lidgates in London. Most of the butcher’s shops I’ve worked in are 6am starts, I love that time of day, especially in the warmer months! What do you miss about New Zealand in general but also when it comes to food? I miss my friends and family, especially my nephews. I miss sea fishing and eating what you catch the same day, walking in the bush (forest) and the Southern Alps. How often do you use your kitchen at home, do you like to cook? I love to cook but since I started my business I have had not as much time to cook. Nothing better than getting friends round and all pitching in to make an epic feast! My first memory of cooking is making mud cakes in the garden and the first dish I cooked was heating up frozen fries and a hot dog (in New Zealand this is a battered pre-cooked sausage on a stick), I was about 6 years old. Markthalle Neun, Eurogida, The Dairy, Antipodes, Oma Marnie’s Pie Bakery, Erchinger Fleisch und Wurstmanufaktur, and Gemüse Kebab Shop on Kastanienallee. I am starting in the Breakfast Market in the Markthalle Neun on the 16th of November, it is on the third Sunday of every month. Later I want to also get into Streetfood Thursday. Eventually I want to have my own production place where I can make sausages 24 hours a day. After living in London I needed to get out of the rat race, Berlin was the perfect choice. 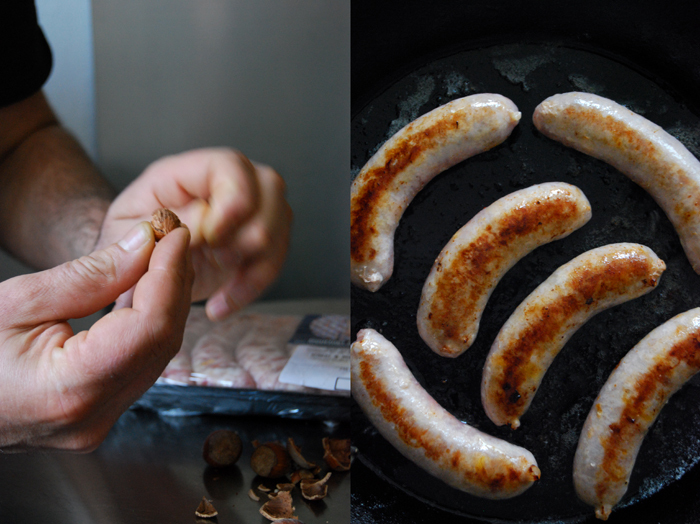 Here’s a recipe for Apple and Sage Sausages. Jamie Oliver, Scottish entrecôte steak, eggs and chips. A massive vegan curry, rice, Raita and Turkish bread, a couple of salads, one including bacon. Whatever sausages I have in the freezer for the meat eaters. Mum’s homemade lasagna with garlic bread and a leafy salad. Now, I have no idea. I like all food, except mustard, I am allergic to it. Actually I’m about to cook a full English for some friends, that’s one of my favourites… great way to start the day. Cooking with others is preferred, although I find cooking alone fine as long as I have some good music to listen to. Homemade falafel, it’s so frustrating cooking without a deep fryer! cooked these little babies in a little butter and oil, yes? more info tattoo’d to memory. i believe i could eat a skyscraper filled with sausages and still want more. making them myself is an absolute joy. i am a charcuterie dreamer. 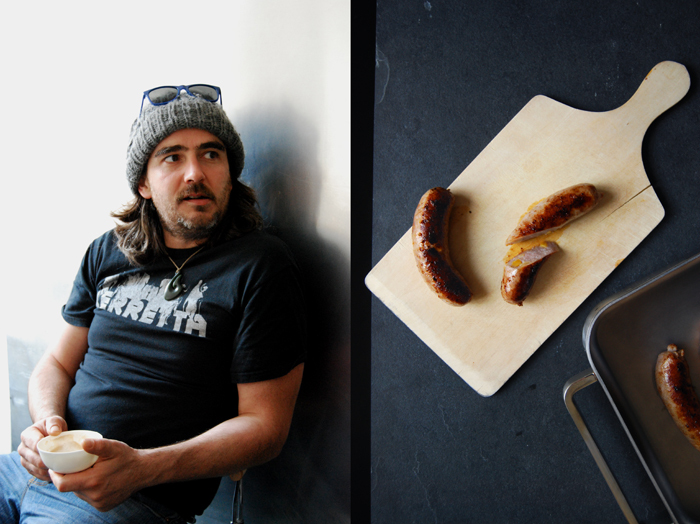 10000000 thank you hugs to you and sausage man for the recipe and write-up insight. 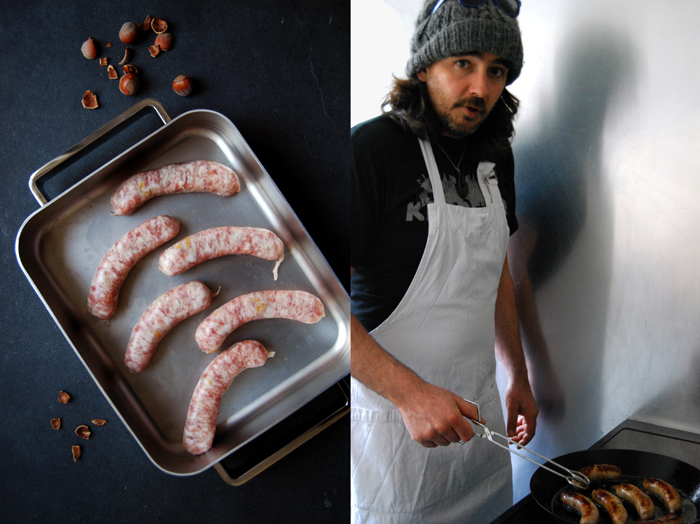 Simon is the king of sausages, he makes the best! Simon used 2 apples for this recipe which is about 300g, so even more than you mixed in. 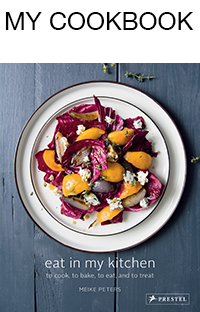 His sausages aren’t softly flavoured, the additional ingredients he uses like fruits, herbs or nuts are quite present in his compositions, similar to British sausages. If it’s too much for you, feel free to adjust it to your taste, but keep in mind that the apples can easily be overpowered by the meat. Please keep in mind that the sausages stay fresh in the fridge for just 2-3 days, you could also freeze them if they were made from fresh meat. Thanks and let me know how it worked out! Well they turned out great! ! ! When you said that Simon does not use a light hand when he flavors his sausage, I am a bit confused. These sausages were fantastic, and I can imagine that if he was using well raised pork they are out of this world. But to me the flavors were subtle but good. 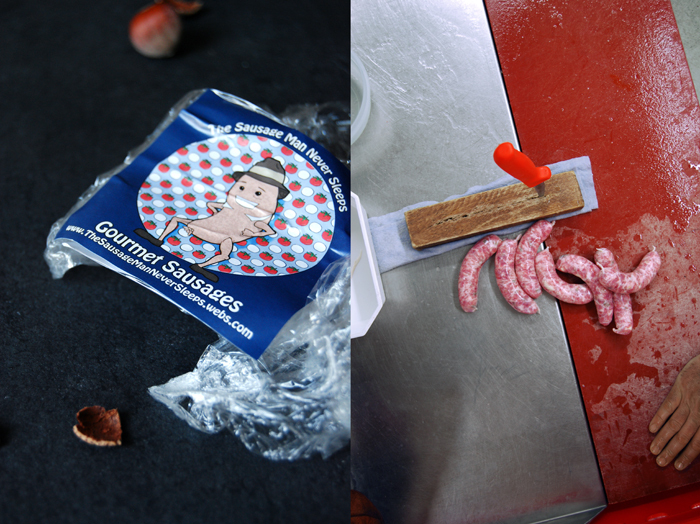 All in all I will keep this in my sausage repertoire. My complements to Simon and to your for another very very good recipe, and back ground story. By the way I will be giving a few of the sausages to my friends and freezing the rest for an sunny cold winter Sunday morning. Thanks Susan! all I can say is do it, its not hard to achieve amazing results! That’s why I love my job so much. I love this post! My husband and I have wanted to make our own sausage, and now I am inspired! Need to shop for a meat grinder!!! Thank you, and much admiration goes to Simon!